Sam Shropshire hits a backhand. The senior provided veteran leadership in the Wildcats’ weekend sweep. After another undefeated weekend, Northwestern is on the verge of making history. The No. 9 Wildcats (9-0) earned victories over Boise State (1-6), Harvard (5-3) and Duke (3-3) this weekend to tie the program record for most consecutive wins to begin a season. NU dominated the Broncos to begin its homestand. Doubles wins from seniors Sam Shropshire and Konrad Zieba and senior Strong Kirchheimer and freshman Dominik Stary sealed the opening point for the Cats. 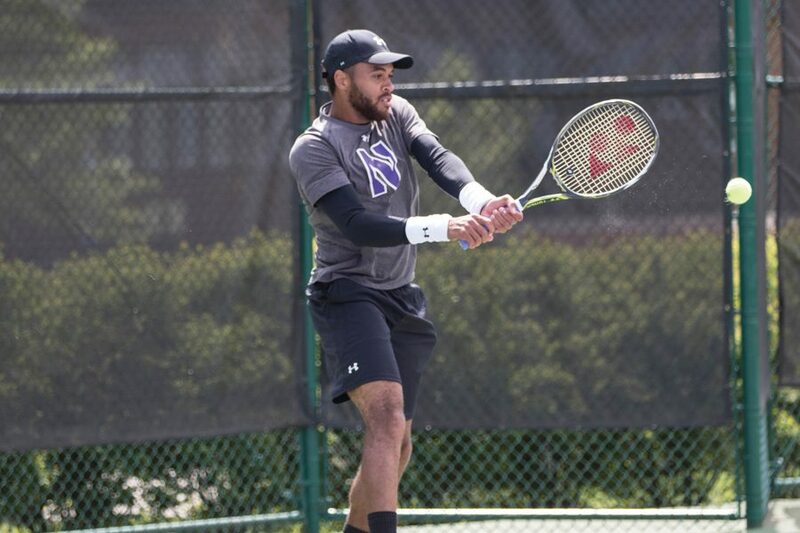 Zieba and sophomore Jason Seidman notched wins to start singles play for NU. Kirchheimer, who ranks No. 26 in the country individually, followed with a 6-1, 6-1 victory for the Cats, who swept Boise State 4-0. The win over the Crimson did not come easily for NU despite a similar 4-0 result. The team has a history of gritty matches with Harvard — three out of the previous four meetings were decided by a 4-3 margin — and Saturday’s contest was no different. After a loss at No. 3 doubles to begin the match, NU called upon its veterans, who answered in a big way. At No. 1, Shropshire and Zieba took a 6-4 set win, keeping their perfect record on the year as a pair. Kirchheimer then held serve with Stary, and the Cats took the doubles point yet again. Seidman earned a 6-1, 6-1 victory at No. 6 to start singles play. After a Zieba victory at No. 3, NU needed only one point to clinch the match. Kirchheimer delivered with a 6-3, 6-3 triumph at No. 1 to give the Cats their eighth straight win. Sunday’s win over the Blue Devils proved to be the toughest for NU. After close victories at No. 3 and No. 1 doubles, the Cats secured the doubles point, staying perfect on the season in that regard. The singles portion of the matchup proved similarly competitive. Though a loud and energetic Kirchheimer cruised to a 6-3, 6-1 victory at the top spot, two Duke wins at No. 5 and No. 4 locked the score at 2-2. But keeping with the theme of the weekend, NU’s veterans stepped up and helped bring home the Cats’ record-tying victory. Zieba fought off a set point in the second frame, fighting back and taking the tiebreaker, 7-4, sealing the win at No. 3. With NU one point away, the pressure fell on Shropshire, who finalized the 4-2 win and tied program history with a crosscourt volley. Zieba said the team’s perseverance was key in the record-tying victory. The team will look to break the record when it travels to North Carolina State on Friday. The Cats beat the Wolfpack 6-1 in Evanston last season. Despite the near-historic start to the season, Zieba said the team is looking ahead. Swan agreed, but added that NU is more than satisfied with the start.